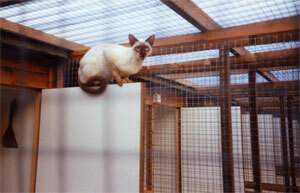 Heinz and Elisabeth Hahn welcome you and your cat to Knuston Boarding Cattery. 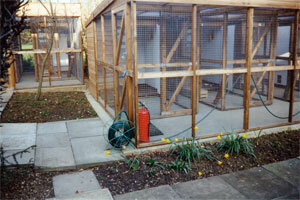 This is the cattery that sets the standard for care and commitment for your pet. Our cattery has been specifically built to meet the Feline Advisory Bureau (FAB) and the British Small Animal Veterinary Association (BSAVA) top class criteria, to ensure that the highest degree of comfort, security and hygiene is always maintained. Cats requiring flea and/or worm treatments, any medication including Diabetic care e.g. urine sampling and insulin injections when necessary are all most welcome. 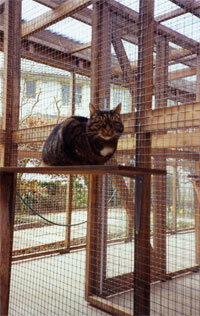 Knuston Boarding Cattery was approved by the Feline Advisory Bureau in 1995. Used by the Bureau as a training centre over many years for people wishing to open and run catteries of the highest standard. 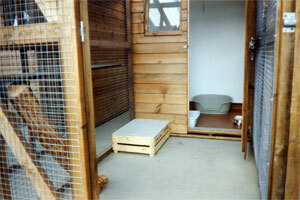 Vets with their own pets frequently use our facilities. Owners are most welcome and encouraged to visit Knuston Boarding Cattery to inspect our premises before boarding their cat. 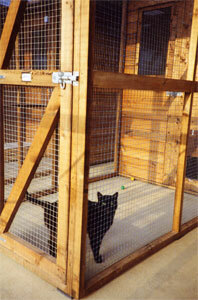 The Knuston Boarding Cattery standard size chalet is generous enough to house two cats comfortably. 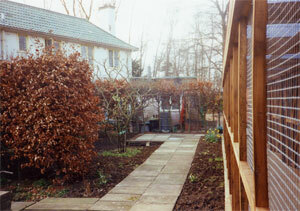 Family sized units are available which will easily accommodate up to four cats. Only cats from the same household may share accommodation. Owners are welcome to bring the cat's bed or sleeping basket and any bedding with which the cat is familiar to facilitate settling in. There is a generous space between each run so that while each cat can see its neighbour, there can be no direct contact. As we are constantly working in and around the cattery throughout the day, your pet will in no way feel abandoned or neglected, instead he/she will be able to enjoy lying in the sun watching us and the antics of the neighbours. All cats must be immunised against Feline Infectious Enteritis and upper respiratory infections (Cat 'Flu). An up to date vaccination certificate must be produced upon on arrival. Boosters must have been administered no less than 10 days before boarding. Please book as early as possible in order to avoid disappointment. It would be helpful if firm dates and times of arrival and collection are given. A door to door collection and delivery service is available.